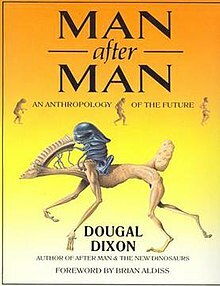 Man after Man: An Anthropology of the Future is a 1990 speculative evolution book written by Scottish geologist Dougal Dixon and illustrated by Philip Hood. The book also features a foreword by Brian Aldiss. Man After Man explores a hypothetical future path of human evolution set from 200 years in the future to 5 million years in the future, with several future human species evolving through genetic engineering and natural means through the course of the book. Man after Man is Dixon's third work on speculative evolution, following After Man (1981), which explored the animals of a hypothetical world 50 million years in the future where humanity had gone extinct, and The New Dinosaurs (1988), which explored the animals of a world where the Cretaceous-Paleogene extinction event never occurred. Unlike the previous two books, which were written much like field guides and explored factual natural processes through fictional examples and worlds, the focus of Man after Man lies much on the individual perspectives of future human individuals of various species, mainly focused on how they perceive the changing climate, which they are specifically engineered to be adapted to, around themselves. 200 years hence (the year 2190 A.D.) climate change has changed the face of the planet. With rising sea levels swallowing coastal cities and the environmental impact of overpopulation becoming apparent in a lack of resources, civilization is slowly collapsing, with a few selected humans escaping Earth to colonize space. To effectively construct great starships, governments have engineered new human species to aid in gathering resources underwater — the aquamorph (Homo aquaticus), with gills instead of lungs — and species to aid in construction in the vacuum of space — the vacuumorph (Homo caelestis). 300 years hence, the anatomically modern humans that stayed behind on Earth have split into the Hitek (Homo sapiens machinadiumentum), almost totally dependent on cybernetic technology, augmenting and keeping their bodies alive well past their natural lifespans, and their handlers (still Homo sapiens sapiens). Though the older genetically engineered species in space and underwater have become extinct as a result of fulfilling their purpose and being sterile, a new species of fertile underwater human, the Aquatics (Piscanthropus submarinus) are created as a final project by the genetic engineering facilities before they are shut down. 500 years hence, the Hitek pursue to construct genetically altered humans to sustainably occupy niches in the ecologically recovering world. These new species include the plains-dweller (Homo campis fabricatus) designed to live on open grasslands with the adaptations of a large herbivorous mammal, the forest-dweller (Homo silvis fabricatus) created to live in rainforests, the tundra-dweller (Homo glacis fabricatus) adapted to a polar climate and the temperate woodland-dweller (Homo virgultis fabricatus), superficially similar to the ancient australopithecines. Genetic material used to make these species is derived from the Andlas, anatomically modern humans who mostly live as farmers and fishermen (the word "Andlas" being speech corruption of "Handlers"). 1000 years hence, some Hitek choose to abandon their "mechanical cradles" in favor of artificially created organs and "biological cradles", becoming a new subspecies known as the Tics (Homo sapiens accessiomembrum). Both the Hitek and the Tics artificially manufacture food products to sustain themselves, relying on solar and marine energy harvesting to fuel their processing facilities. A magnetic reversal results in the failure of the navigation, communication and energy harvesting technologies that the Hitek and Tics rely on, causing their extinction. The magnetic reversal also impacts the farming, animal husbandry and hunting of the Andlas, leading to their (and by extension Homo sapiens as a whole) extinction. The disaster leaves the genetically engineered animal-like species as the sole living human descendants. As a result of the extinction of Homo sapiens, these humans can no longer be genetically tweaked and altered in labs and instead they begin to evolve through natural selection and other natural evolutionary processes, resulting in many new and diverse forms over the course of several millions of years. These new species range from the memory people (Homo mensproavadorum) that through their genes can recall memories of previous generations, symbiotic humans (symbionts) consisting of a symbiont carrier (Baiulus moderatorum) providing movement and protection against the cold and a hunter symbiont (Moderator baiuli), colonial and hive-building humans with a single reproductive parent (socials, Alvearanthropus desertus), parasitic humans (Nananthropus parasitus) attaching themselves with sharp teeth and claws to the flesh of their hosts (Penarius pinguis), goblin-like fishing humans (fish-eaters, Piscator longidigitus), ant-eating humans (ant-men, Formifossor angustus) and saber-toothed predatory humans (spiketooths, Acudens ferox). After five million years of uninterrupted evolution, the spacefaring descendants of those humans that escaped into space return to the planet. No longer recognizing the planet as their home world and bearing little resemblance to their original ancestors after five million years of genetic engineering, the spacefarers dramatically xenoform Earth and cover it in vast domed alien cities. The spacefarers wear pressurized suits and use cyborg technology to fuse the bodies of the few human species they find useful on the planet with air tanks and respiration systems. Genetic engineering is used to modify the human descendants on Earth into giant building humans ("engineered pack-animals") and tiny humans working intricate machinery to aid in city construction and maintenance. Genetically modified species are also created for other purposes, such as antelope-like humans that serve as mounts and grotesque massive humans whose flesh is processed and consumed as food. As with the civilization of modern man and the Hitek before, this new era of civilization doesn't last, and the spacefarers soon return to space after consuming all the resources Earth had to offer. All terrestrial life on the planet perishes as the atmosphere is almost emptied of oxygen, leaving most of the human descendants extinct. Only a deep sea descendant of the aquatics, Piscanthropus profundus, survives the extinction level event and continues to evolve, expressing curiosity in what lies above the water. Dixon's previous speculative evolution book projects, After Man (1981) and The New Dinosaurs (1988), used fictional examples to examplify real-life factual natural processes. After Man focused on the processes within evolution and projected them into a hypothetical future scenario set 50 million years after the extinction of mankind, where various hypothetical future animal species were used to explain the concepts within evolution. The New Dinosaurs, meanwhile, had a focus on the science of zoogeography, using fictional species in a world where the Cretaceous-Paleogene extinction event never happened to explain the process. Initially, Man After Man was intended to be a project where fictional examples would be used to explain factual processes, like the previous books. The original idea involved mankind avoiding catastrophes such as overpopulation and mass starvation by inventing time travel and moving 50 million years into the future to re-establish civilization. This original Man After Man would have been set in the same world as After Man and would have focused on man-made catastrophes destroying the ecosystem established in the previous book. Dixon was reluctant to be involved in the final version of the project, which instead focused on changing climate conditions through the eyes of future human species engineered to adapt to them, and has in subsequent interviews referred to it as a "disaster of a project". The original Man After Man concept, mankind destroying an established ecosystem, was later used by Dixon for another project where mankind colonized an alien planet with a complex and unique ecosystem. This project, published as the book Greenworld in 2010 (though so far only released in Japan) follows human colonization of the planet Greenworld over the course of a thousand years, showing how mankind affects its ecosystem. ^ Dixon, Dougal (1990). Man After Man. Blandford Press. ISBN 978-0713720716. ^ a b c Naish, Darren. "Of After Man, The New Dinosaurs and Greenworld: an interview with Dougal Dixon". Scientific American Blog Network (Interview). Retrieved 2018-09-21. ^ "An interview with Dougal Dixon - OUGH.gr". OUGH.gr (Interview). Retrieved 2018-09-22.